The delegates from Japan arrived at 22:30 in the local time. They were warmly welcomed by some members of the Bridge Club Maldives and Kalaafanu School Students. The hearty welcome was begun with the welcome drink of coconut water which is the fruit of the national tree of the Maldives. Followed by was few cultural performances by the Students of the Kalaafanu School. The Host Families did not come to receive the participants due to the late hour of arrival. After the arrival, the JAs and the Officials’ accommodation was arranged in Mookai Hotel due to the late hour. Next day morning, followed by the breakfast, the JAs and the officials were taken to Kalaafanu School where the JAs were received by the Host Families of Maldives. This event also began with a colorful welcome including welcome drink and dance which was Boduberu, a traditional dance of the Maldives. Followed by this was more cultural performances with local refreshments being served. As the cultural show was going on, there were cultural stalls set up in the different parts of the school compound showing the Mission Participants the lifestyles of the Maldivians. After the end of the event, JAs departed with their Host Families for homestay. The Officials were given an orientation session by the Bridge Club Maldives. The JAs were at the homestay during the day but the officials stayed at the Hotel. 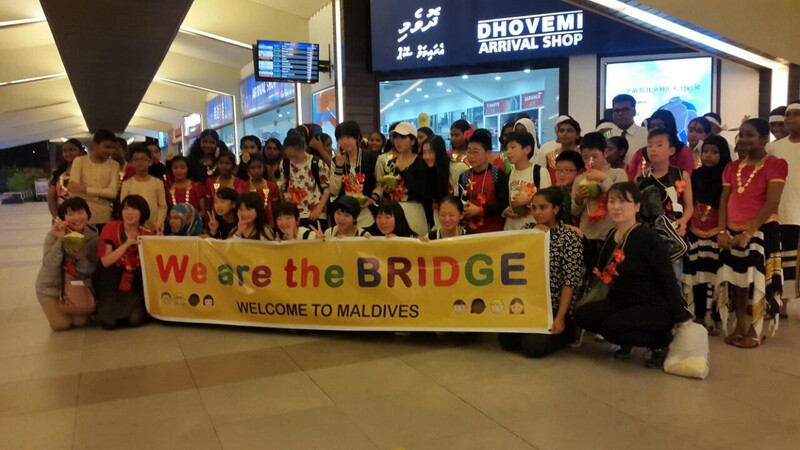 The members of Bridge Club Maldives accompanied the Officials all the time throughout the trip. After the lunch, there was a trip to Vilin’gili, a district of Capital City for sightseeing for the Officials. As the very first thing on this day, there was a meeting in Ministry of Education by the Minister of Education, Her Excellency, Dr. Aishath Shiham. The Officials and the JAs took part in the meeting. The Minister and the delegates discussed about the long history of Maldives – Japan friendship. There was also distribution of souvenirs for the JAs by the Ministry. Followed by the meeting, there was a barbecue in the afternoon organized by many Host Families together with many JAs in Villin’gili. The Officials stayed in Male’ itself and went for sightseeing in Male’ and souvenir shopping. There was also a Dinner organized by the Ministry of Education for the Officials. On the fourth day, the JAs were at homestay. The Host Families individually organized different activities for the JAs varying from family to family. The Officials were taken to another district of Male’, the Hulhumale’ City for sightseeing and for swimming and snorkeling. In the evening, there was a Male’ tour for all the JAs and the Officials in which information about the landmarks of the Male’ City were given in Japanese by a local translator group. The JAs returned to homestay after the tour and the Officials headed to the Dinner organized by the Bridge Club Maldives with the former JAs, PAs and the LO. On the day before the departure, the JAs, Host Families, Officials and some members of Bridge Club all departed to an island within the atoll known as Maafushi. The main purpose of the trip was to allow the Japanese delegates to experience the island life and natural beauty of the island. 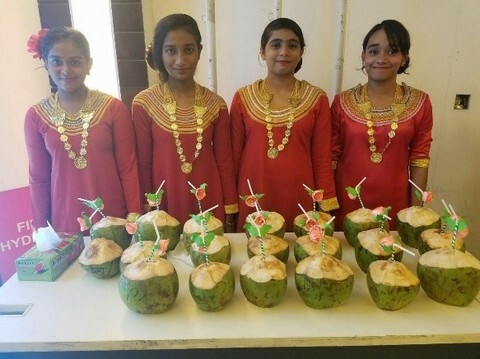 The participants were welcomed by the Maafushi School with the welcome drink and few performances by the Maafushi School students. They were also given a chance to swim during the trip. After enjoying, they arrived safely back to Male’ in the evening and headed to the Farewell Party in Kalafanu School. The Farewell party was begun by a speech from the Japanese delegates after the introduction. 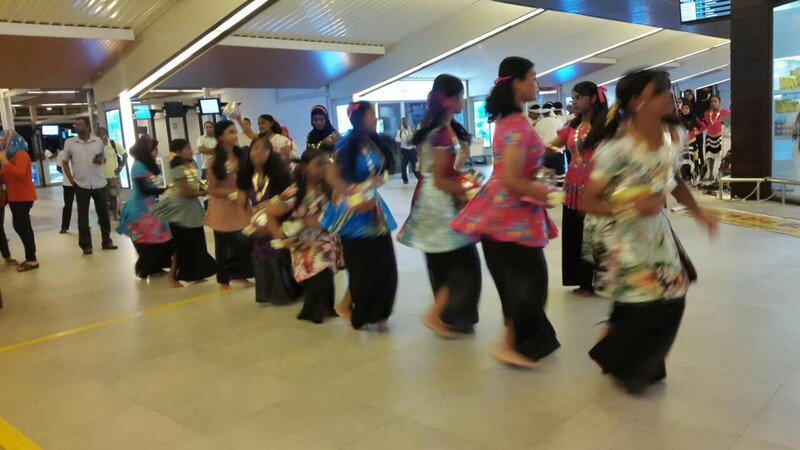 Followed by that was a cultural performance by the Bridge Club members of the Maldives. After that, the Japanese JAs performed their cultural dance and everybody had a good time enjoying the performances from both the countries. Followed by the cultural items, was distribution of souvenirs by the Bridge Club of Maldives to the JAs and the Officials. Then, refreshments (Maldivian snacks) were served with the traditional dance of Maldives, Boduberu ongoing at the stage. The function was ended by the the APCC theme song ‘WE ARE THE BRIDGE’. All the JAs were accompanied to the Mookai Hotel by the Host Families where the Officials stayed. From there all the JAs, Host Families and the Offcials headed to the Airport to bid farewell to each other. The departure was at 1 pm in the local time. The Mission was overall a successful project in this year as well! We look forward to the next year’s Mission Project!